"The reigning queen bee at Ghana’s most exclusive boarding school has her sights set on the Miss Ghana Pageant. But a new student captures the attention of the pageant recruiter—and the previously hive-minded students. 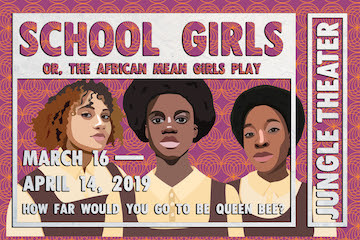 Award-winning playwright Jocelyn Bioh’s buoyant and biting comedy explores the universal similarities (and glaring differences) facing teenage girls across the globe." As the subtitle suggests, School Girls, or The African Mean Girls Play shows some of the worst ways in which women (young or otherwise) can compete amongst themselves. However, the prize for these Ghanian students has real value—a chance for a more promising future. Playwright Jocelyn Bioh was inspired by the true story of the 2011 Miss Ghana Pageant, won by an American-born contestant whose Ghanian parentage was never confirmed. At their boarding school, Paulina (Ashe Jaafaru) is the undisputed queen bee, bossing and bullying her classmates while insisting on her own superiority. The other students fall in line until a new student starts school. While Paulina brags of getting presents from her relatives in America, Ericka (Eponine Diatta) has actually lived in the United States. Paulina is incensed by their defection, lashing out at all of her classmates. Eloise Amponsah (Hope Cervantes) is a former Miss Ghana, and she is now a recruiter for the pageant. The students all intend to audition, hoping for the chance to improve their prospects for the future. When Eloise sees the biracial Ericka, she explains to the headmistress that her lighter skin will make her a more viable contestant, and thus help Eloise's own career. 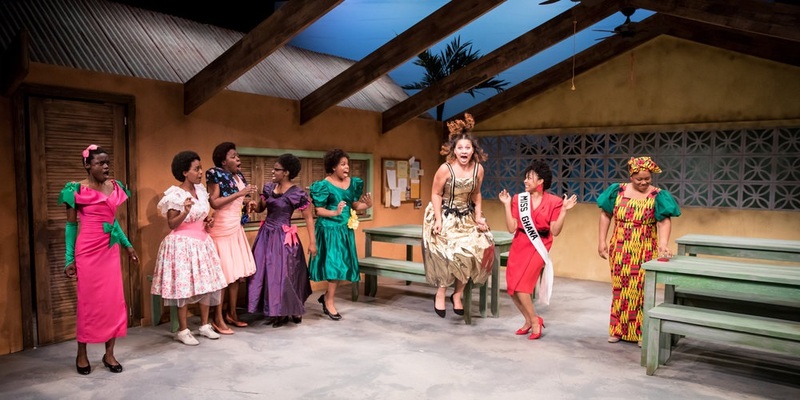 There are some serious ideas here about beauty standards, colorism, and opportunity, but it's also a very funny play with incredibly relatable characters, and moves quickly under the strong direction of Shá Cage. As the students, Jaafaru, Diatta, Kiara Jackson, Aishé Keita, Salome Mergia, and Nimene Sierra Wureh are all wonderful, creating distinct and fully-realized personalities and convincingly portraying teenagers dealing with their minor and major dramas. Cervantes is convincing as the pragmatic Eloise, and Hope Cervantes exudes warmth as the headmistress who clearly cares deeply for her students. The set, designed by Seitu Jones and Bianca Janine Pettis, under Karin Olson's lighting, makes you feel the warmth of the African location. 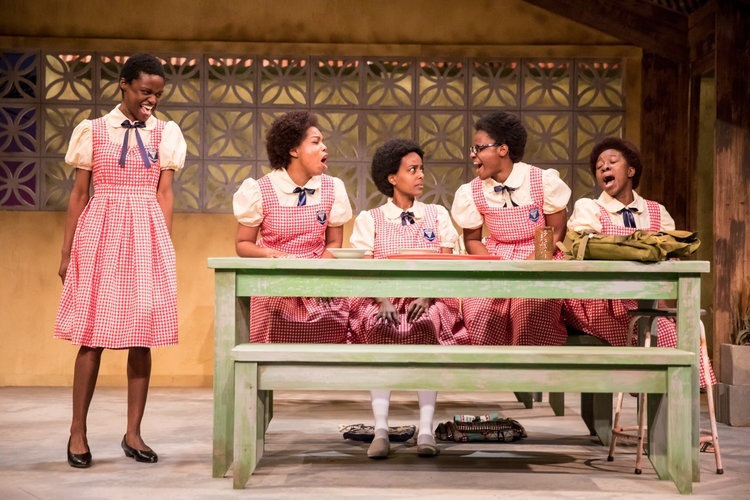 Jacqueline Addison's costumes are perfect both for the school uniforms and for the audition outfits, wildly appropriate to the play's 1985 setting. The actors use convincing Ghanian accents, thanks to the help of dialect consultant Grace Nbedu. It's wonderful to see a play about women with so many women on the production team. School Girls is a delightful play, beautifully performed. If you can, stay for the post-show discussion. Usually, two of the actors come out to talk with the audience after the show, but we had almost the whole cast by the end of our discussion. Audience members had great questions about the process of the play and the actors' feelings about the subject matter. And it was a treat to see the actors as grown women, when they had felt so real as teenagers just moments before. For more about the detrimental effects of colorism among Africans, read the story "Fairness" by Chinelo Okparanta's story "Fairness" in the collection Happiness, Like Water.